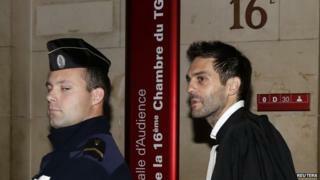 Image caption Moreau's lawyer, Pierre Darkanian, described the seven-year sentence as "a purely punitive response"
The first jihadist to be tried in France after returning from Syria has been given a seven-year jail sentence. Flavien Moreau, 28, travelled to Syria and joined an Islamist militant group, but says he only stayed for a dozen days because he missed smoking - banned by the jihadist group he joined. A man who received money from Moreau was sentenced to four years in jail. France estimates that about 1,000 of its citizens are or have been involved with jihadist groups. Dozens have been arrested and are awaiting trial. In court on Thursday, Moreau was given the maximum sentence sought by prosecutors. Moreau's lawyer, Pierre Darkanian, described it as "a purely punitive response", Reuters news agency reported. Mr Darkanian did not say which militant group Moreau had joined, but said it was neither Islamic State or Nusra Front, Reuters added. Born in South Korea, Moreau was adopted by a French family in Nantes at a young age. He had 13 previous criminal convictions, and converted to Islam after leaving prison. He travelled to Syria at the end of 2012. Moreau told the court he found a smuggler to take him to a town controlled by Islamist fighters, where he bought a gun and ammunition. However, he denied taking part in any fighting. "I found it really hard not to smoke... so I gave my weapon to my emir and left," he said. Anti-terrorist authorities arrested him in January 2013 when they learned he was attempting a return to Syria. Farid Djebbar, 26, was also put on trial, and sentenced to four years in jail, with an 18-month suspended sentence. Djebbar was investigated after authorities found he was in regular correspondence with Moreau and accepted cash transfers from him. Convictions for involvement with radical jihadist groups are becoming commonplace in Europe. Separately on Thursday, a court in Germany jailed four men for being members or supporters of al-Qaeda, and planning a terrorist attack. In the UK, a woman was jailed for 28 months after being found guilty of funding terrorism in Syria. The EU's anti-terrorism chief has said that more than 3,000 Europeans have joined Islamist fighters in Syria and Iraq. France has the largest Muslim community in Europe outside Russia, and is thought to provide the biggest contingent of Western jihadists in Syria and Iraq. Iraq and Syria: Who are the foreign fighters?